December 2, 2014 – Hi Everyone! It’s Martha from the food blog A Family Feast, and we’re sharing another delicious and healthy recipe with you today – Grilled Chicken with Roasted Vegetables and Whole Wheat Couscous. Couscous isn’t actually a grain. It’s tiny bits of dried pasta made from the starchy white part of the Durum wheat berry. Whole wheat couscous has nutritional advantages similar to choosing whole wheat pasta over white pasta. We oven-roasted a medley of vegetables including carrots, onions, peppers, mushrooms and garlic until golden and caramelized, then tossed in some fresh baby spinach for even more healthy flavor! Next, all of those wonderful healthy vegetables are combined with grilled chicken, whole wheat couscous and some creamy goat cheese – and dinner is served! What’s really great about this dish is that you can do a lot of the preparation ahead of time – cutting up the vegetables or even grilling the chicken the day before if you’d like! This recipe makes a wonderful weeknight dinner your whole family will love – and any leftovers make a terrific lunch the next day too. In a large bowl, toss carrots, onions, peppers, mushrooms and garlic with ¼ cup of olive oil, salt and pepper. Spread vegetables on 2 sheet pans, do not crowd. Roast for 15 minutes, turn with a spatula and roast for 15 additional minutes. Add spinach, toss the mixture to combine. Place vegetables back on sheet pans and return to oven. Cook just until spinach has wilted. Brush chicken breasts with 1 tablespoon olive oil. Grill for 2-4 minutes to establish grill marks. Turn and grill for 2-3 additional minutes until chicken is cooked through. Let rest for 10 minutes before slicing. Bring chicken broth and remaining 1 tablespoon olive oil to a boil, add couscous. Remove from heat, cover for 5 minutes. Fluff with a fork. 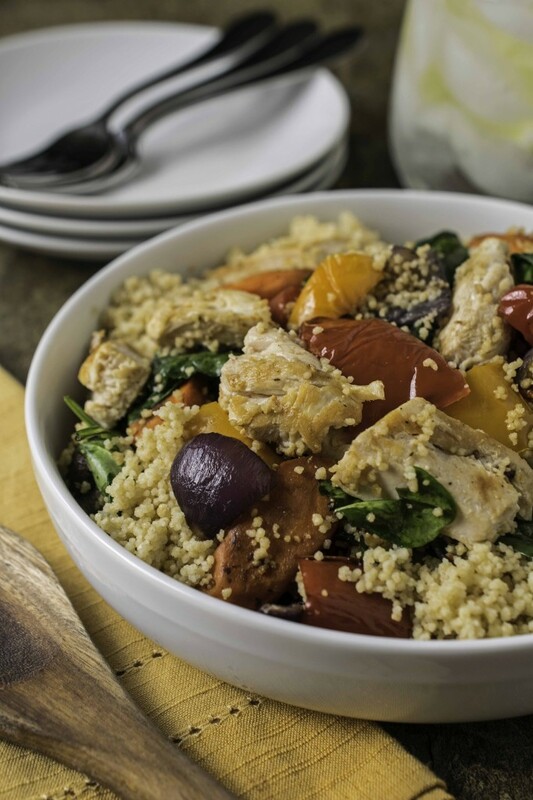 In a large serving bowl, combine hot couscous, roasted vegetables, chicken and goat cheese. Toss to combine, stirring so that goat cheese melts evenly throughout the dish. Recipe and Photo Courtesy of Martha Pesa, A Family Feast. I love how simple and nutritious this is, and the fact that it’s so pretty is just a bonus! Hi June, please contact Customer Service at http://bit.ly/aldicustserv for more info about Seasonal item availability.